Blessed Clelia Merloni was beatified on November 3 in the Basilica of St. John Lateran during a Mass celebrated by Cardinal Angelo Becciu, Prefect of the Congregation for the Causes of the Saints. During his homily, Cardinal Becciu praised Blessed Clelia for keeping her gaze “always turned to God,” especially in time of trial. It was a habit that would carry her through a life riddled with trials that began in the earliest years of her life. Born on March 10, 1861 in Forli, Italy, Clelia was still a toddler when her mother died and her maternal grandmother became her guardian. Her father, an ambitious businessman, remarried in 1866. Her new stepmother, along with her grandmother, did much to instill strong religious values in little Clelia along with a great love for God. Sadly, her father became so involved in his work and rising status in the world that he eventually left the faith and became a freemason. He very much wanted a luxurious life and planned for an extravagant marriage for his daughter, but Clelia’s heart was already taken. As she grew, so did her desire to consecrate herself to God in the religious life. She was a lively and decisive girl who knew what she wanted, much to her father’s dismay. As a result of her choice, he banished her grandmother from the house. His marriage to his second wife became a struggle from which Clelia would often retreat into her room to pray for her father’s salvation. She would offer penances, such as walking with a pebble in her shoe, for his redemption. Clelia responded to the turbulence in her life by submitting herself ever more deeply to the Lord and decided to offer her life in return for her father’s redemption. As a result, in 1892, she entered the Congregation of the Daughters of Our Lady of Providence where she dedicated herself to religious life with great joy. During this time, she suffered a serious lung disease which doctors gave no hope of survival; however, after making a novena to the Sacred Heart of Jesus and the Immaculate Heart of Mary, she was completely healed and restored to perfect health. The order grew quickly. They opened a school for young children, a home for the elderly, and an orphanage, all due to the generous support of her father. When he died in 1895, after being restored to the faith on his deathbed, he left Clelia a sizeable estate. Although she rejoiced in his conversion and the gift of his estate, the money turned into a financial disaster due to a dishonest financial administrator that not only brought about great humiliation on the order but turned public opinion against them. Clelia was forced to leave Viareggio and sought refuge with the order based in Broni. Thankfully, she later met the saintly Bishop of Piacenza, Blessed Giovanni Battista Scalabrini, who took the new order under his wing and approved its Rule. 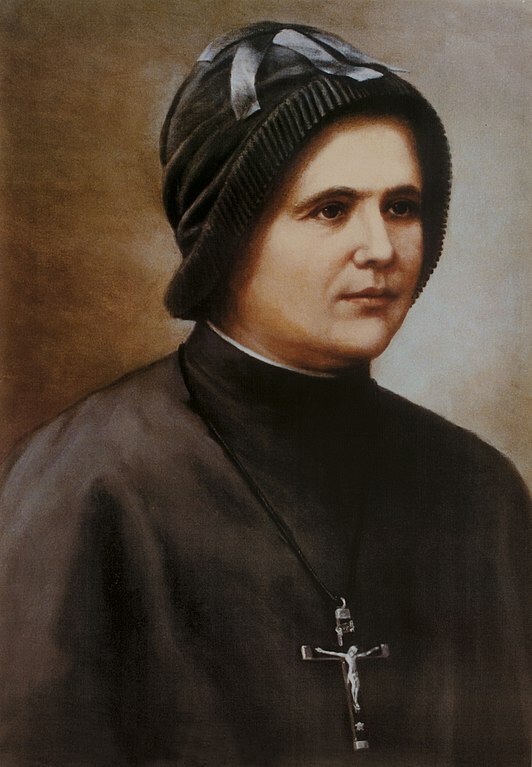 On June 10, 1900, he accepted the profession of Mother Clelia and more than a dozen other companions and allowed the order to establish its seat in his diocese. One of the bishop’s stipulations was that the order extend to the foreign missions. They obeyed, and sent religious to Brazil and Boston. By 1903, there were 30 houses with 200 sisters. But once again, Mother Clelia’s life became mired in troubles. Internal struggles saw the order splintering into two groups – those who wanted to remain faithful to the founding charism and those who were dedicated to following the directives and spirituality of the bishop. After the financial disaster and the legal issues that resulted from it, Clelia soon found herself the victim of slander. Because she did not want to publicly accuse the priest who had mismanaged and stolen money from the Congregation, she blamed herself, which led to serious misunderstandings and accusations. The problems culminated in 1911 with a Vatican order that removed her from leadership of the order and named Marcellina Vigano as the new Superior General. Even though she repeatedly asked for her case to be reviewed, Mother Clelia was never answered. In the meantime, the discord grew until the sisters who were faithful to Mother Clelia were ousted from the order. Thinking herself to be the reason for the problems, she decided to leave the order rather than see it destroyed. In 1916, she requested and received permission to be dispensed from her religious vows. In 1920, Mother Clelia wrote to the Pope and begged for permission to return to the order. Her prayers went unanswered until 1928 when she was finally permitted to return. Mother Clelia, who was now aged and in poor health, spent the last two years of her life in a room far from the community that was attached by a small choir loft that overlooked the altar. These were years of intense prayer and charity for everyone as well as making a complete offering of herself to the Eucharistic Heart of Jesus for the salvation of souls. She died in Rome on November 21, 1930 and was buried in the cemetery Campo Verano. The Congregation of the Apostles of the Sacred Heart of Jesus requested the opening of her cause for Sainthood in 1988. In 1990, she was declared a Servant of God. Her path to beatification began with a miracle that occurred in 1951 and involved the inexplicable healing of a Brazilian doctor named Pedro Angelo de Oliveira Filho, who was stricken with a disease known as Landry’s paralysis or Guillain-Barre syndrome. The paralysis quickly spread until he was unable to swallow and could barely breathe. On March 20, doctors informed the family that there was nothing else they could do for him and that he would not survive the night. The doctor’s wife, Angelina, sought out Sr. Adelina Alves Barbos who brought a holy card and relic containing a piece of fabric from Mother Clelia’s veil. Together with the family, they prayed for Mother Clelia’s intercession. Sr. Adelina placed the tiny relic in a cup of water and gave it to the dying doctor to drink. He managed to swallow some of the water. Within a few minutes, he was able to drink even more. This was followed by a cup of milk and, finally, a cup of custard, all of which he was able to swallow without a problem. When the attending physician arrived in the morning and saw how well his patient was doing, he declared it to be a miracle. Within three weeks, the once dying doctor was walking normally. He was released from the hospital and lived the rest of his life in perfect health. This miracle was approved by Rome in 2017 which led to the beatification that took place this past weekend. In spite of the many calamities of her life, she believed that we must “have courage and unlimited confidence in God” and to throw ourselves blindly “into the ocean of divine Providence” – regardless of whether this brings joy or sorrow. Most importantly, she clung to her vocation as a daughter of God, letting neither a stubborn father, an unscrupulous thief, and back-biting sisters stand in her way. Instead, she relied on her feminine genius to receive those God sent to her for ministering, to mother those who needed nurturing, and to generously embrace her enemies with sensitivity and grace. At Women of Grace®, we know that there is power and strength in authentic femininity, and we are devoted to helping women discover it! Click here to learn more!